Some of the greatest geniuses had remarkable memories. Mozart, according to legend, sat and listened to Allegri’s “Miserere”, then transcribed the piece of music, entirely from memory, later in the day. Kim Peek, the savant who was the inspiration for the blockbuster film, Rain Man, memorised as many as 12 000 books. But unlike Mozart, who composed more than 600 works during his brief life, Peek was unable to distinguish between the relevant and the irrelevant, or discover hidden meanings and metaphors in the texts he had committed to memory. Is international academic migration stimulating scientific research and innovation? 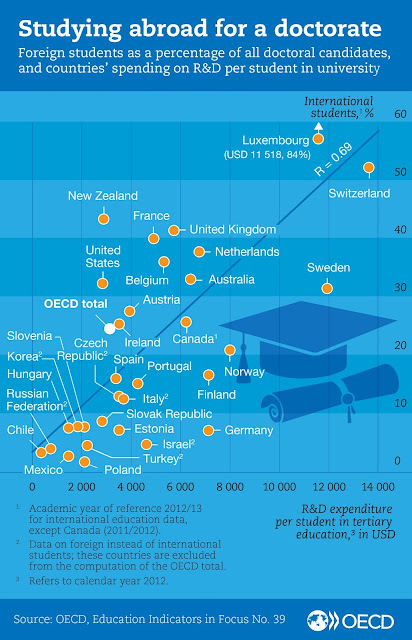 Higher education and academic research are among the most rapidly globalising systems. Today, around 5 million students study and do research in a country other than their own, attracted by the quality of overseas universities and willing to complement their education portfolio with international experience. Employers generally value the impact international education has on the skills and mind-set of graduates, and see international experience as indispensable for future global leaders.